PeakStars has released MagicColors, a powerful Windows application that turns ordinary photos and images into stunning masterpieces. Using its unique regional colormapping technology, MagicColors automatically enhances the colors and contrast of images. Before PeakStars introduced its regional colormapping technology, photographers had two alternatives: Learn to live with murky pictures with many low-contrast areas, or use High Dynamic Range imaging (HDR software) to merge multiple photographs at different exposure levels to overcome these contrast problems. Today, with regional colormapping, it's possible to create images with astonishing richness and contrast, even in the dark areas that are usually veiled in gray in most photos. MagicColors needs only one image to improve these degraded contrast regions. The software identifies regions with different light levels within an image. A unique colormapping algorithm is applied to improve the contrast of that region. In simple terms, the program redistributes light values and enhances contrast. But you have to see the before-and-after images to appreciate how MagicColors can transform a snapshot into a valuable commercial photograph which is rich in detail throughout the image. Business people and home users can use MagicColors' preset values to quickly turn ordinary pictures into memorable ones. Professional photographers and web designers can fine-tune the process, and create exactly the image that they need for the job at hand. With simple slider bars, you can select the number of regions that are mapped, as well as the pixel distance between neighboring regions that influence each other. Two additional sliders allow you to adjust the high-shift (light colors) and low-shift values separately. You can adjust the entire image, or apply the changes region by region. You can even process a batch of photographs in a single operation. Whether you're a professional photographer who needs to optimize all of the images that you create for a client, a business person who wants to add drama to web and brochure photos, or a home user who would like to create family photos and keepsakes that everybody will love, MagicColors has the tools that you need. 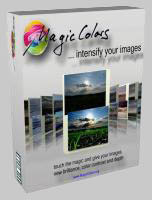 MagicColors runs under Windows 95/98/NT4/2000/XP/Vista, costs $124(US) for a Personal License or $193(US) for a Professional License, and may be purchased securely online from http://www.magiccolors.org/. An affordable Student License is also available, as well as a free Demo Version. For more information, write to peakview@peakstars.com or visit http://www.magiccolors.org/. MagicMedia, an easy-to-use thumbnail explorer that makes it simple to organize, manage, play, edit, and share all of your media files. ZoomMagic, the professional's tool, which takes accurate screenshots and helps editing pixelprecise on screen.